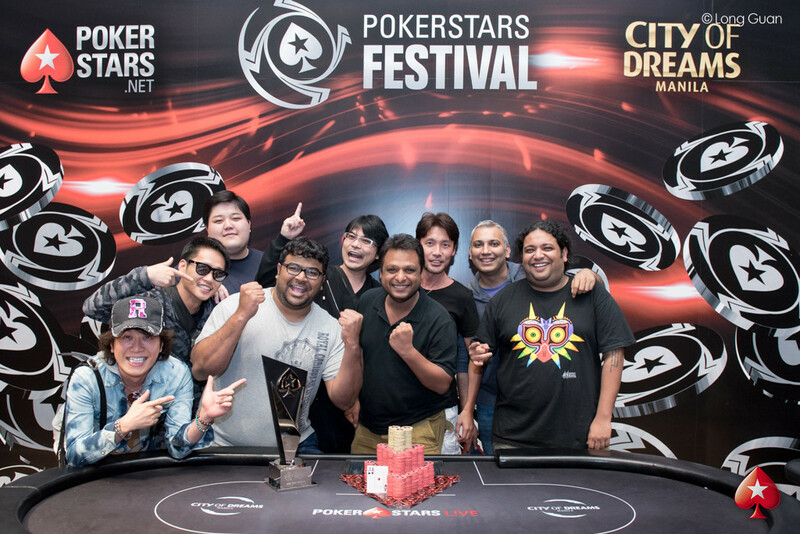 The 2017 PokerStars Festival Manila at the City of Dreams entertainment complex has come to an end with the first-ever PokerStars Festival Manila ₱55,000 (~$1,092) Main Event champion being crowned at the PokerStars LIVE poker room. After three starting days and the penultimate tournament day, only 14 players out of a 594-entry strong field remained. The largest international tournament in the history of the Philippines with a buy-in of PHP30,000 or more easily surpassed the ₱20 million (~$397,230) guarantee. With the lion's share of the ₱28,809,000 prize pool (~$572,190) still up for grabs, all finalists had ₱285,000 (~$5,661) locked up for their efforts and Michael Falcon was leading the survivors. The 55 year-old Dane also made Day 2 of the PokerStars Cup as well and multi-tabled both tournaments at the same time, reaching both final tables in spectacular fashion. Falcon finished 6th in the Cup and was sent to the rail in 3rd place in the Main Event to cash for more than ₱2.6 million combined. Uday Bansal held a slight lead over Antti Halme when the tournament was down to the last two hopefuls, and both players briefly discussed a deal without initially coming to a conclusion. However, when they returned to the seats, both agreed to ICM numbers and left ₱300,000 (~$5,953) as well as the trophy up for grabs. It took less than an hour to crown a champion, and it was Bansal who came out on top. Bansal from Delhi/India considers himself to be an amateur at the tables. The 30-year-old is the co-founder of a company called SkyBulls which boasts financial advising by artificial intelligence. Bansal previously attended London Business School where he earned a Master’s Degree in business administration and management. He’s been playing poker for the last 7 years and to this date his biggest poker accomplishment is coming running up in the India Poker Championship for $15,942 in 2015. "Sure, Antti has more experience playing than me, playing heads-up, but I think in heads-up there’s a lot of variance. So I wanted to do a deal based on ICM. But he felt that he is a better player. And he is, heads-up, to be fair. But we ended up coming to an agreement and it’s all good," Bansal mentioned when asked about the deal he struck with Halme. Halme, a 27 year-old full-time poker player from Tampere/Finland, made the trip over to Manila alongside fellow countryman Aki Virtanen, who also cashed in the Main Event and came 8th in the PokerStars Cup. "I’m pretty happy,” Halme said about his finish. “The whole day when I came here I was a bit nervous, but the way it turned out, it was really good. I had a pretty good stack in the beginning, and I took some hits in the final two tables and I was in a tough spot between two big stacks, so getting to heads up was really good." Both Finns will be heading to Barcelona for the upcoming PokerStars Championship. The final day had barely started when Corbin White became the first casualty. The American poker pro got his short stack in with ace-jack and Michael Falcon called with ace-queen. A king-high flop gave both players a gutshot, but ultimately the kicker played to eliminate White. Next to join the rail was Raphael Gall. The German moved in for 15 big blinds from the button with jack-ten and Uday Bansal looked him up with pocket nines to stay ahead after an ace-high board. Yo Seb Rhee, who had already finished 4th in the ₱215,000 High Roller Shot Clock during the festival, had to settle for 12th place and the Japanese busted in a big pot against Uday Bansal. Rhee was in the small blind and called a raise by Hoa Thinh Nguyen before Bansal three-bet from the big blind. Nguyen got out of the way, but Rhee four-bet and eventually called the five-bet shove by Bansal with ace-jack. Bansal's move with king-seven paid off after spiking a king on the flop and that vaulted the Indian into the top spot. Duc Nguyen ran with pocket sevens into the pocket tens of Hoa Thinh Nguyen and there was no upset on a queen-high board. The final table bubble saw several players get short, but instead it was Germany's Andre Peters that was sent to the rail in cruel fashion. Peters three-bet shoved with pocket queens and Michael Falcon eventually called with pocket sixes to spike one of his two outs on the river and set up the following nine-handed final table. Down to just seven big blinds, Tien Than Nguyen moved all in with king-jack suited and picked up a call by Uday Bansal with pocket sevens. Neither jack, king or diamonds showed up on an ace-high board and Nguyen became the first casualty. Fellow countryman Hoa Thinh Nguyen followed shortly after, losing a flip with pocket tens against the king-queen of Michael Falcon when a queen came right away on the flop. Kenneth Buck, a 61-year-old former Australian Air Force member that now lives here in Manila, was blinded out and forced all in from the big blind with ace-three. Michael Falcon held ace-four in the big blind and a possible split pot was crushed with a four on the river. Sam Razavi, from Brighton/England who now calls Asia his home, finished runner-up in the APPT Manila Main Event last year for $73,552, has become a poker stalwart in the region with live tournament earnings of over $1.5 million. Razavi's bid to finish one place better than the previous year came to an end when he three-bet shoved with ace-eight and received an instant call by Antti Halme. There was no help on the board and Razavi had to settle for 6th place. Down to the last five, Korea's Jaehyun Lim was the short stack and three-bet all in with queen-jack suited. Mike Takayama called with ace-king suited and flopped top two pair. Instead of a ten for the straight to help Lim, another king hit on the river and Takayama scooped the pot with a full house. Takayama, the last local player in the field and 4th place finisher of the 2016 APPT Manila, would be the next to fall. He four-bet all in with ace-eight and Antti Halme quickly called with pocket jacks to see the board run out queen-high. Michael Falcon dominated Day 1b, the vast majority of Day 2 and the early stages of Day 3 before losing big chunks of his stack. The Dane made a move on a nine-high flop against both Antti Halme and Uday Bansal, and the latter called with queen-high for top pair to see Falcon turn over seven-three for a gutshot only. Both turn and river were blanks and the heads-up for the title and trophy was set. After unfruitful first deal discussions, both players came to an agreement and the battle one-versus-one lasted less than an hour. 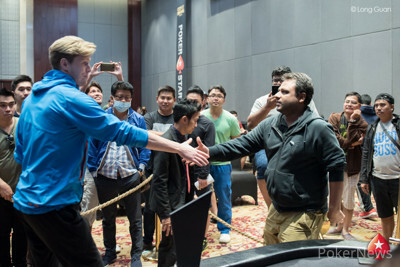 Antti Halme lost a big chunk of his stack when rivering two pair with seven-five suited only to see Uday Bansal called with ace-six suited for the better two pair. Eventually, Halme found himself at risk with ace-ten and Bansal had the dominating ace-jack. It was all over after a jack came on the turn and the Indian rail celebrated. That brings an end to the PokerNews live reporting here from Manila, and the next live event is just around the corner. 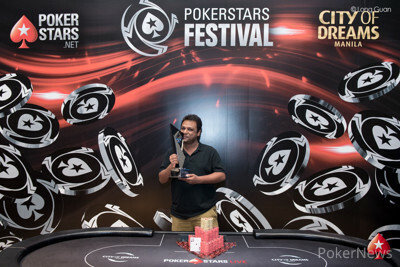 The PokerStars Festival Manila has a champion and it is India’s Uday Bansal who is victorious. Bansal continued to apply the pressure and kept Antti Halme on the back foot and while the Finnish player shoved on two occasions to take the blinds and antes he could not recover. Uday Bansal moved all-in from the button and whittled down to his last 1.45 million in chips and sitting in the small blind Halme peeked down at his cards and made the call immediately for his tournament life and the cards were turned over. The cards have not been falling the Finn’s way since heads-up started and Halme was behind again, his ace dominated by Bansal’s and the flop was of no help and Bansal was just two cards away from fortune and glory and the watching rail crowded around. The turn brought cheers from the watching Team India and left Halme drawing dead and Halme got to his feet to shake his opponent’s hand. 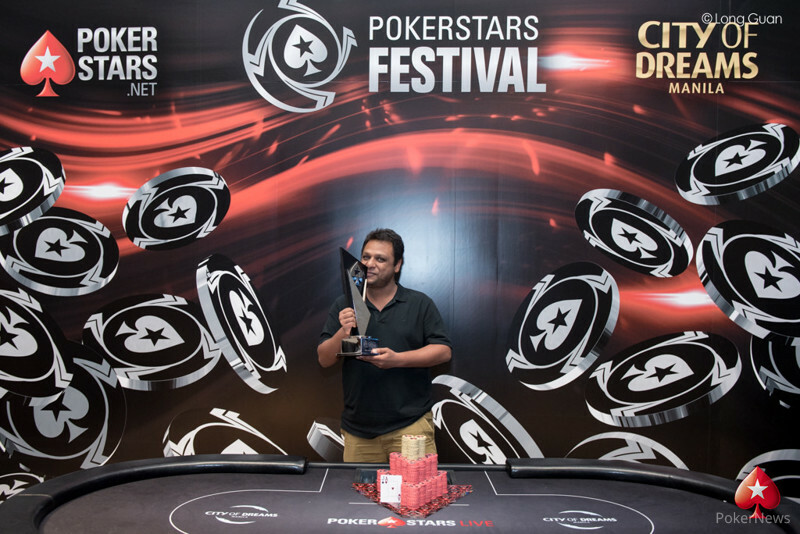 The river was merely a formality and the PokerStars Festival Manila has its first ever champion in the form of India’s Uday Bansal who takes the trophy, title and the equivalent of $86,836 with Antti Halme taking home $84,797 for his runner up finish. Uday Bansal raised to 180,000 and Antti Halme called to see a flop of , which Halme then saw checking and calling a bet if 200,000. Both players checked the on the turn before the river completed the board. Halme bet 375,000 and Bansal gave it some thought before announcing all in. Halme started some table chat and said "difficult to get a read from you, always relaxed," before talking through possible hands and also mentioning the nine-five suited Bansal had played earlier with a successful bluff against Michael Falcon. Eventually, Halme let go and was left with around 30 big blinds. Halme's next two button raises to 180,000 where met with a three-bet jam by Bansal, and the Finn folded both times to get even shorter. While it looked as though the momentum was with the Finn a massive pot played out between the two that saw Uday Bansal regain a commanding lead. It all started with a raise, as is often the case, with Antti Halme making it 180,000 to go on the button. Bansal responded with a re-raise to 450,000 and after thinking it over Halme made the call to grow the pot to 920,000. Bansal led out for 500,000 on the flop and after several seconds of thinking Halme coolly slid in the call to swell the pot to over 1.9 million. The turn saw Bansal fire again, making it 800,000 and the Finn stacked up a sizable tower of red 25k chips and slid in the call once more to see the pot grow to 3.4 million. The river completed the hand and now Bansal slowed down the action and checked. Halme reached for chips and counted out three stacks of reds before announcing a bet of 3 million. Bansal thought it over, but not for all that long before announcing call. Halme turned over for a rivered two pair, but this was not enough to beat Bansal’s flopped two pairs and the Finnish player took a big hit. Antti Halme raised to 180,000 and Uday Bansal called to see a flop of . Bansal checked and Halme won the pot with a bet of 200,000. Soon after, Bansal min-raised to 160,000 and picked up a call by Halme. The flop of and the turn were checked before Halme's bet of 300,000 on the river shut down all further action. Halme picked up most small pots so far and almost closed the gap. Uday Bansal won the first hand of heads-up pre-flop after coming over the top of an Antti Halme 180,000 button raise to the tune of 500,000 and the Finn let it go. Halme won the second after calling a Bansal 180,000 button raise and check calling another 180,000 continuation bet on the flop before firing for 400,000 on the turn to take down the hand. The elusive gold trophy and PHP300,000 ($5,953) are still up for grabs and the action has just recommenced with one hour left in the current level. Discussions of a deal have restarted and both parties are attempting to come to an accommodation. As soon as more details are available we will let you know.